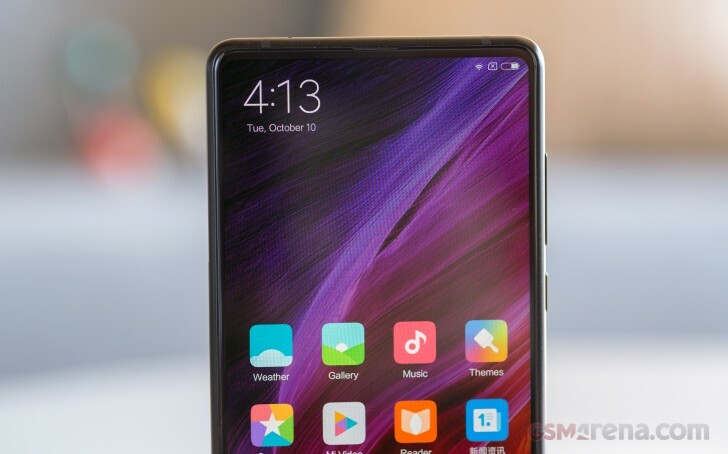 It should come as no surprise that just like the the original Mi Mix, Xiaomi is centering its PR efforts around the impressive nearly bezel-less display, or Full screen display 2.0, as they refer to it. Rightfully so, since even as the trend becomes more popular, few devices can match the pure visual appeal of Xiaomi's design. 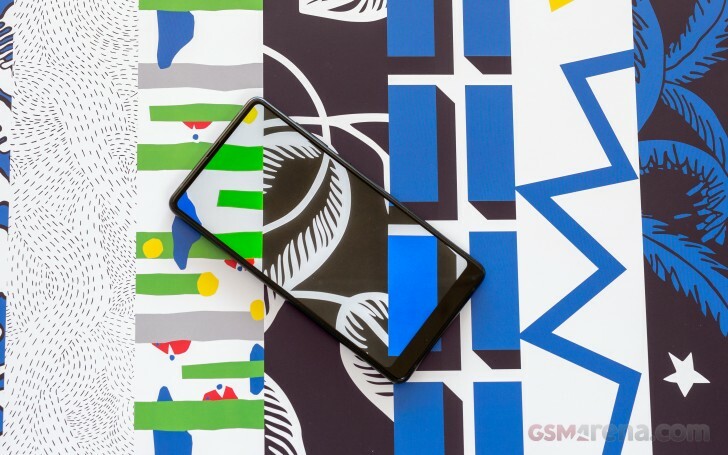 Like we mentioned earlier, the screen on the Mi Mix 2 has been moved down ever so slightly compared to its predecessor in order to accommodate what the company is referring to as a "Sound guided speaker design". So, even though there is a more conventional speaker underneath the display this time around, the cunning design only requires a mm or so of extra upper bezel space. Another thing that contributes nicely to the overall look of the Mi Mix 2 is the 12% smaller bottom chin, compared to the original Mix. Xiaomi achieved this through Chip-On-Film technology. The actual display controller has been shrunk down quite a bit and so has the selfie camera. Frankly, even if it was technically possible, shrinking the bottom bezel further would leave you with a severely less comfortable grip on the phone, so this feels just right. Beyond its nicely rounded and elongated 18:9 silhouette, the actual panel is also impressive in itself. At least in some respects, that is. With a 5.99-inch diagonal and a resolution of 1080 x 2160 pixels, it doesn't really constitute a resolution upgrade over its predecessor. However, swapping the 17:9 aspect ratio for an increasingly popular 18:9 one might prove to be a really significant change in the long run. Judging by the current Android scene, as well as upcoming devices, this 2:1 aspect is quickly becoming standard, which means that appropriate content will follow. With a pixel density of 403, the Mi Mix 2 is plenty sharp. Contrast is not that great, due to a combination of some light bleed at 0% brightness and only 387 nits at full blast out of the box. It is important to note that this number represents the panel's behaviour with default settings. Xiaomi didn't implement any max auto overburn mode on the Mi Mix 2, but toggling Increased Contrast mode in the Display settings menu does bump up the maximum brightness to a much more respectable 515 nits. The mode increases contrast a bit as well. Viewing angles on the Mix 2 are not great. Color shift starts creeping in at about 30 degrees in any direction. Still, it is not severe and perfectly easy to live with. Sunlight legibility is nothing to phone home about either, although its score is still respectable. In real world terms, the handset remains perfectly usable outdoors. Just don't angle the sun straight at it. The panel in the Mi Mix 2 is still an IPS LCD, like on the previous model. However, it is surprisingly color accurate this time around. Some settings are required, though. The default Automatic contrast mode works well enough, but results in an average deltaE of 7.1 and a maximum of 8.5. It is also the only mode that allows shifting the gamma to warm or cold, if that is your thing. However, if accuracy is what you are after, don't fiddle with that at all and simply switch over to Standard contrast mode. Dial the brightness down a bit to about 76% and you can expect color deviations as little as deltaE 0.9 on average and a max of deltaE 2.5. Xiaomi is marketing the Mi Mix 2 as a "Global bands" device, "great for business professionals", etc. This sounds perfectly believable thanks to the dual SIM support and especially the powerful X16 LTE modem, inside the Snapdragon 835 chipset. 24 LTE bands should have you well covered. If not, there are seven HSPDA ones to fall back to as well. And if all else fails, quad-band GSM support. Theoretical download speeds of Cat.16 mean up to 1GBps. 4x20 MHz carrier aggregation is another glorious bonus to enjoy, provided your carrier can provide the network to match this. On the local side, the Mi Mix 2 is fully decked-out as well. You get Dual-band 802.11ac Wi-Fi and a fresh new Bluetooth 5.0 radio. NFC support is there too - and full-featured at that - including card emulation support. 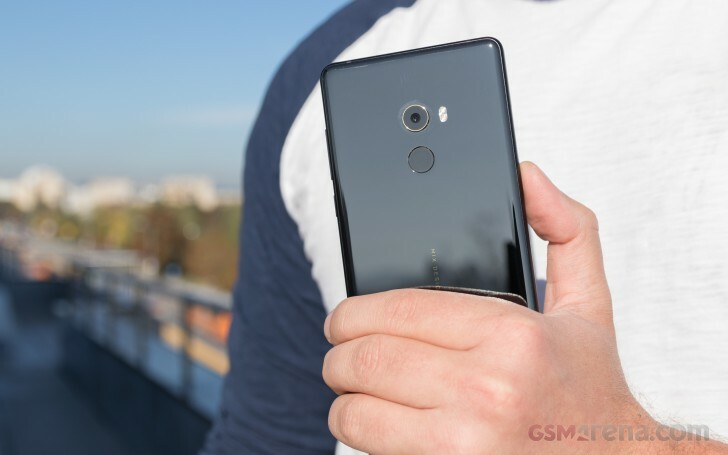 Sadly, there is no FM radio receiver in the Mix 2 - a pretty typical omission on most current flagships. We were kind of hoping for an IR as well, since Xiaomi does still offer it on a large segment of its portfolio. Unfortunately, it is missing from the Mi Mix 2. 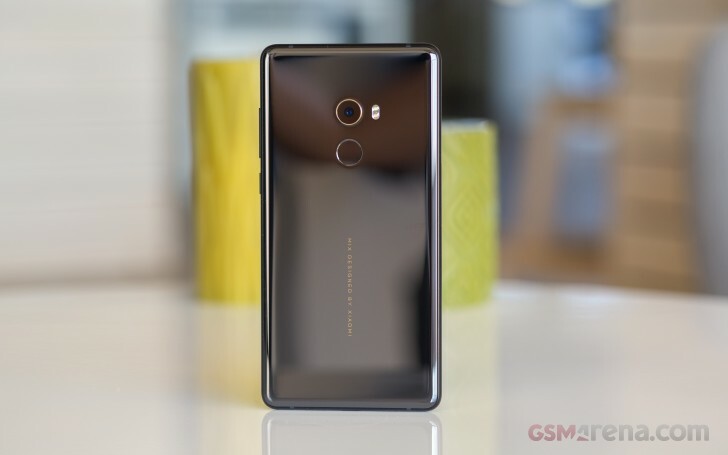 After the demise of the 3.5mm audio jack, the Mi Mix 2 is only left with a single port. So, connecting more than one thing at a time definitely means living the dongle life. On the plus side, Xiaomi didn't skip on any trimming for the Type-C port. Its audio output is actually analog, as opposed to Type C digital audio. That means you don't need expensive dongles or headphones, but only a passive adapter to get the sound out of the internal DAC. If the latter is not up to your personal audiophile standards, you can still leverage digital audio output through the same port. Data transfer reached USB 3.0 speeds in our tests, so you can count on 5Gbps transfers, given the right equipment. While we are sure many users will appreciate the overall shrinking in size and weight of the Mi Mix 2, compared to its predecessor, it does come at a price. We are referring to the significantly smaller 3,400 mAh battery, in particular. However, that is only part of the reason why the Mix 2 managed a notably lower 65 hour score in our standard endurance test. The X16 LTE model inside the Snapdragon 835 actually managed to hang on to a network signal just as long as excepted in our talk time and standby tests. It's the other two scores that actually drag the overall rating down. We are inclined to attribute the poor on-screen efficiency mostly to OS optimization issues. That being said, a 65 hour rating is not catastrophic. It is actually roughly what the smaller iPhone 8 manages as well. So, we'll just call it serviceable, but not remarkable in any way and hope for better luck with a future update. Battery capacity aside, it is nice to see Quick Charge 3.0 support, just like on the original Mix. Wireless charging is still a notable omission, but if you hook up the Mix 2 with a proper charger, it can charge from 0% to 47% in only 30 minutes.